Indo western outfits are a perfect attire for stylish Indians, why? Let’s Find out! We are sure if you are landed on this blog, chances are you are seeking for something different, something unique that will just set you apart from the crowd. We can all agree that clothes have evolved the basic purpose in the modern world. Clothes are just not a mean to cover up your body, they are more than that, they speak, they express who you are, and that’s when indo western dresses come into the picture! Indo western outfits are how modern men and women adorn their personality. These outfits are the stunning unfolding of the evolution of an Indian attire. As the name suggests, Indo western outfits are made blending the style and cuts of Indian-Asian and western dressing. There is not one thing that we adore about these outfits, they are comfy, classy, unique, stylish and trendy, these are the reasons why they are getting hugely popular among people, especially men and women of new age. B- town divas like Sonam Kapoor, Kangana Ranaut and handsome hunks like Ranveer Singh, Amir Khan etc have appeared in these exquisite fusion outfits time to time. This baggy kurta or tunic is complimenting the carefree attitude of Sonam Kapoor when she appeared at the Gateway School’s art exhibition in Mumbai. An easy, breezy indo western outfit with a touch of personalization. Tisca Chopra in a printed floor-length dress with a drape attached, hinting a saree style of draping. What do you think about her indo western dress? Sonam Kapoor at Cannes 2017 sporting sea-blue, House of Masaba creation. Is not she looking absolutely amazing in this beauty, a saree with pants? This Indo western dress is flowy yet hugging the body flaunting curves and, yet revealing the right amount of skin. Graceful, classy and sassy! This saree style anarkali is perfect for any festival like Diwali, or wedding functions like mehendi, sangeet etc. This Indo western outfit in particular is really comfortable and radiates fine grace. This off shoulder and Palazzo is a perfect indo western dress for a wedding guest, but don’t limit yourself, it makes a gorgeous dress for some gala event or parties too! Asymmetric hemline, color blocked with the dupatta or scarf attached, this type of Indo western outfit is worth a steal. It’s cool and versatile, can be worn on occasion, just use your imagination and accessories you have to style it in a way you want and as per the event. How about trying something like this on wedding or festivals? Ritesh Deshmukh has surely impressed us with this amazing indo western outfit. Dhoti style Indo western outfits are the latest sensation not only the B-town divas but among all the fashion lovers. Dhoti design has been incorporated with sarees and kurtis and Anarkali also. 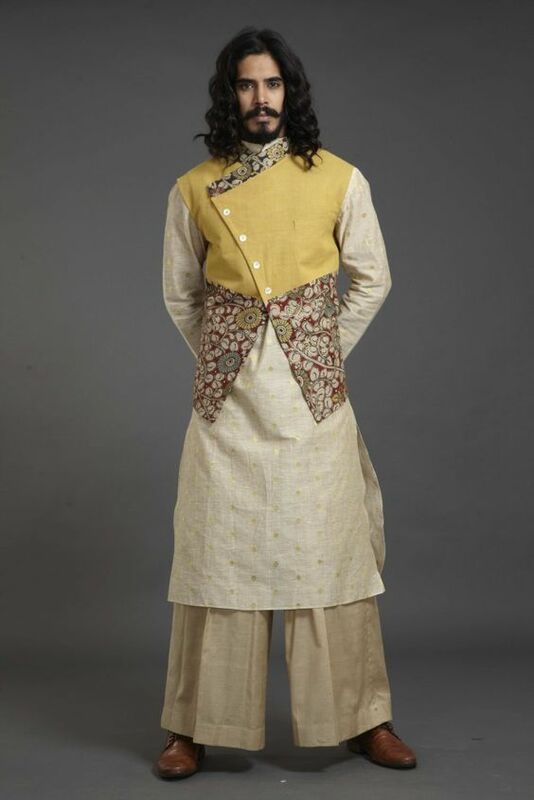 Let’s check out some of the edgy, quirky and creative ensembles of this stylish Indo western outfit. Now let’s look at scintillating dhoti style ensembles for women. Top with dhoti pants, perfect for those who have a taste of some edgy bold dresses. No one can pull off the Indo western outfit like the fashion goddess Sonam Kapoor does. Go for this audacious designer Indo western outfit. Salwar jumpsuit is hippy, comfortable piece of clothing, suitable for any casual events. Crop top with, dhoti and Jacket on top. If you have been wearing Anarkali with churidars, try short length Anarkali with dhoti bottoms. Sarees are the epitome of grace and reflect our colorful Indian culture and traditions, however, Saree has also acquired some really modernistic twists. Long flared jacket with a Saree, who would have thought about it, yet it is loaded with style and grace. What do you think about this version of saree? And if you are wondering when to wear, adorn this outfit for the cocktail or themed party and be assured of getting zillions compliments. Dhoti style sarees are again a masterpiece of creativity and look bit similar to Marathi style of draping sarees. Many celebs have been appearing in this stunning Indo western outfit lately. Don’t you want to try any? Saree with pants have quite a futuristic look to it, modern and elegant at the same time! This is for women who want to wear saree but not in the traditional way. Look utterly glamorous with this lust-worthy Indo-western ensemble. Saree gowns are a hassle-free version of Saree with a lot of oomph to it. Extremely easy to wear and maintain, this style of saree is must-have Indo western outfit for every girl. Everybody is familiar with the comfort of the palazzo, they are there in everyone’s wardrobe. Palazzo is quite versatile and can be worn with any type of kurti be it short, long and even with Anarkali too! There is no restriction who can wear Indo western outfit, it’s for both men and women. Check out the images below. Aditi Rao is looking angelic in this Indo western outfit. How do you find it? If you have noticed Indo Western outfits are quite comfortable and flatter all body types, this one on the top reasons why is it getting popular among the youth. There is no denying some of the Indian ethnic wear is bit cumbersome or difficult to carry throughout the day. Another thing that you would have been surprised about if you noticed that, most of the Indo western outfit can be created by mixing and matching of what ethnic wear you have, so you don’t have to worry about your pocket to look stylish. Let us know if you enjoyed this post and got the indo western outfit ideas. It’s high Time to experiment and flaunt some charm with your looks guys! Wao, these indo westerns are perfect! I love the fusion saree, are these pattern available in the market.